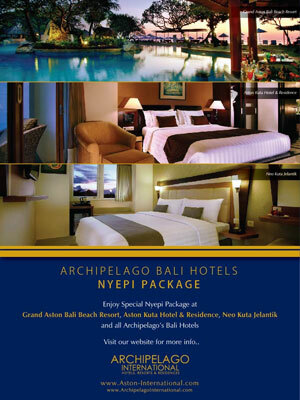 Bali, 26 February 2014 ï¿½ Archipelago International's Bali-based hotels are currently preparing for Bali's ï¿½Day of Silenceï¿½, by offering a number of Nyepi Packages to keep guests entertained on the island's spiritual day. Known as the ï¿½Day of Silenceï¿½, Nyepi is the Hindu celebration in Bali where, for 24 hours, all daily activities come to a halt. For 2014, Nyepi falls on Monday March 31. The day is a public holiday in Indonesia, and from 6am until 6am the following day, the Balinese will fast, meditate and stay silent. Nobody is allowed to walk the streets and the use of electricity is restricted. Ngurah Rai International Airport will also be closed, with overhead flights being redirected around the island. The day before Nyepi is also important for the Balinese, named Tawur Kesanga. On this day, all villages in Bali hold large 'exorcism' ceremonies at the main village crossroads where it is believed demons gather. To scare out the demons, fantastic monsters called Ogoh-Ogoh are made out of bamboo then paraded around the streets like a carnival, together with a loud musical procession. All of the above offers are valid from 30 March to 1 April 2014, and each one includes an increased bandwidth of high-speed Wi-Fi connection. ï¿½As a special day in Bali, we hope to give our guests a wonderful Nyepi experience. Each of the packages offer a wide variety of activities to do in the hotel on the day, and one of the added advantages will be an increased internet bandwidth capacity, which we believe will make our guests feel more comfortable and connected to the outside world.ï¿½ says Norbert Vas, Vice President Sales & Marketing Archipelago International. Archipelago International is one of Indonesiaï¿½s leading hotel operators with an underlying portfolio of more than 70 hotels and 12.000 rooms and a development pipeline exceeding 90 properties in Indonesia, the Philippines and Malaysia. Archipelago managed Hotels operate under the hotel brands Grand Aston, Aston, Aston City, Alana, Harper, Quest, favehotels, NEO and Kamuela ranging from ultra-luxurious private pool villas to serviced apartments and select service economy class hotels, thus offering Indonesiaï¿½s vastest and most comprehensive hotel network.